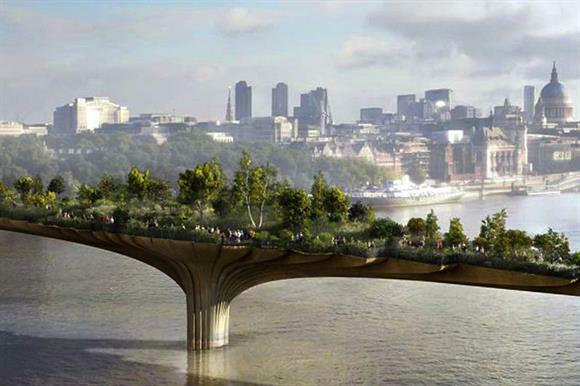 Sadiq Khan, the Mayor of London, has withdrawn mayoral support for the charity that is planning to build the controversial garden bridge across the River Thames. In a letter to Lord Davies of Abersoch, chair of the Garden Bridge Trust, Khan said he could not continue to back the £185m project because the charity had failed to purchase the necessary land to build the bridge and had secured less than half of the promised funding. Khan does not have the authority to cancel the project, but a mayoral guarantee to support the operation and maintenance of the bridge was a condition of planning approvals from the London Borough of Lambeth and Westminster City Council, and without it the project is unlikely to go ahead. The planning permission for the bridge is due to expire in December, and the trust has spent three years negotiating to purchase the land on the south bank of the river, without success. In his letter, Khan said: "It is concerning that a huge amount of effort and expenditure has been expended on other aspects of the project when there is a real possibility that agreement will not be reached before the expiry of planning permission, or at all." He said the funding gap between the amount needed to construct the bridge and the amount pledged to the trust was £70m. The amount pledged to support the project had actually fallen in the past two years, Khan noted, from £85m in spring 2015 to £69m this year. He said it appeared unlikely that the remaining funding would be found and there was a risk that London "would have a partially built bridge which would either require completion or demolition" at public expense. "I am simply not prepared to risk a situation where the taxpayer has to step in and contribute significant additional amounts to ensure the project is completed," he said. Khan’s letter comes after a review carried out by the Labour MP Dame Margaret Hodge at Khan’s request, which concluded that the project was not viable and should be scrapped. The review said cancelling the project would cost the taxpayer £46.4m, including the money already spent, but losing that money was better than risking further funds. Earlier this year, the trust’s annual accounts revealed the trustees were worried that the project was not a going concern. But a Charity Commission case report confirmed that the trust had been meeting its duties and acting in accordance with charity law. Responding to Khan’s letter, Davies said in a statement : "We received the mayor's letter with great regret today. We will study the contents of the letter in detail before responding formally. "The Garden Bridge Trust was set up at the request of Transport for London and the Department for Transport to deliver the project, which had received public money. We have had enormous support from our funders and are very confident we can raise the remaining funds required. But sadly the Mayor of London has taken a different decision to those in place when the project started."